Theme of the first day will be architecture of autonomous spaces. Groups with experience in occupations in the city, constructing architecture in social centers and other spaces outside building permission doctrine will present their projects. After individual presentations (duration cca. 15 min) public discussion will be held with intention to provide common statements and material for the agenda. Theme of the second day of the conference will be urbanism without government. Groups will present their experience in the field of participatory urbanism, direct land use, new cartography and mapping, different perception of the city, interactions with social movements in the city, etc. After individual presentations (duration cca. 15 min) public discussion will be held with intention to provide common statements and material for the agenda. Pula, as important military port, was heavily bombed and almost abandoned in WWII. In early 60`s it received the first urban master plan in Yugoslavia which implemented ideas of self-management in urban planning. Basic idea of the plan was to decentralize city into self-managed political cells called "rajon". Rajons were planned as neighborhoods who have all needed facilities which made them autonomous from the existing center of the city. Decentralization was a tool in urban planing which disabled segregation in the city. Second master plan came in the late 70`s who pushed the idea of urban self-management further. It was focused on more pragmatic level and tried to make self-management more operative. One aspect of the plan was "social contract" or "self-managed agreement" signed by all the actors in the neighborhood who, then, were obligated to perform specific actions so that the plan could be realized. This was the highest level of development of urban self-management. Although the method was democratic in its essence the problem was that the actors and neighborhood assembles were not politically autonomous subjects. They were economically depended on higher level of government and politically depended on communist party which remained centralized despite it stimulated decentralized of society. Self-managed system dissolved in 90`s but transition didn't bring any operative system in urban planning in Pula. Some of the neighborhood assemblies and social centers are still active and it is this informal situation, with no operative system in function, which gives them full autonomy that they never had. Some new social compositions emerge from the transition and they started to use ex military areas which were left empty after break of Yugoslavia. In this "no-man land" or better to say "common land" special socio-economic experiments are active right now with no interference from the government or municipality. We are observing and stimulating these experiment hoping that they are able to produce a system beyond capitalism. AUTONOMY WILL NOT BE GIVEN TO YOU, IT MUST BE CREATED! The forces capable of destroying this society can surely create another one, but that will happen along the way. -- Radio Alice, Bologna free radio station, 1977. The main goal of this text is to sketch the political framework of the Initiative for Muzil. Although this is a description of local conditions in Pula, on the Adriatic coast and in Croatia, its aim is to overcome the specifics of the situation and point to how these fit in with some more general social tendencies. That way, a local experience can be made comprehensible and applicable to resistances in the global context. Right after it gained independence, Croatia officially chose to base the development of tourism, its main economic resource, in the free market model. Accordingly, ownership over land is still being transferred to private corporations in order to regulate more efficiently the (often complex) property relations on the coast. The development processes on the Croatian coast thus take place within the boundaries of the real-estate market, i.e. comprise of selling and buying of land, buildings and apartments. This is an extremely short-term form of economy, since the space is done away with irrecoverably while the profit is created only once, at the point of selling. In order to subject the coast and its population to the imperative of the development of tourism, the state needs take radical measures and pass radical laws. One of the first such legal decrees is the 2004 Protected Coastal Area Act (PCA). The Act commands equal treatment of all land, urbanized or not, within 1km from the coastline. The Act's most important provision requires that all urbanist plans in the area covered by the PCA be approved by the relevant ministry before they can be passed by local authorities. This made the process of urban planning in the coastal regions different from the rest of the country, since towns and municipalities are normally autonomous from the state in their urban planning. On the coast, the state determines the future of the citizens. After the PCA Act was passed, the state started using it as an excuse for a selective demolishing of illegal construction along the coast. The ideology of the PCA is perhaps best summarized in a statement by the Istrian head of county, Ivan Jakovčić: "We need to take care of the illegal settlements problem in order to get exclusive locations" (at the council meeting of Brijuni Rivijera Ltd. company, May 11, 2007). The practice of demolishing houses on the coast exposed the real purpose of the Act: to gain control over the development of local subjects on the coast and create favorable conditions for big investments. The control is firmly in the hands of the Croatian Government, with no influence on the part of local populations or local and regional moguls, who are thus effectively put into a vassal position. The last legal step the state took towards total hegemony on the coast was the passing of the Golf Terrains Law in late 2008. This law allows for quick and efficient expropriation of private land as well as instantaneous re-categorization of public land, all for the benefit of what the new Law defines as national interest: the building of golf terrains. 1) Citizens are excluded from the political sphere because the possibility for their participation in the decision-making process is obstructed. They cannot influence political decisions made by the centralized state, while the public debate on the local level remains secondary to the Government decrees. Elections are equally inefficient because the elected representatives do not represent the citizens who gave them the mandate, but the nontransparent interests of various companies. All existing political parties work against their voters and implement similar capital-driven policies. The latest example of such a political trend is the support that the Golf Terrains Law got from the Croatian Peasant Party despite the fact that the Law represents a direct threat to the peasantry, the party's traditional voters. Such uniformity of political purpose erases differences among the political parties who can reach consensus on all crucial issues. In this form of parliamentary democracy, apparently no political decision has an alternative. For example, all political parties--left, right and regional--immediately reached an absolute consensus around the issue of commercialization of the ex-military areas along the Pula coast. 2) Citizens are excluded from the economic sphere: the decisions about investments on the coast are made by the central government through the master plans, and not at the local level (see above). Economic pressure on the political sphere is most obvious in those master plans that entice investments in the real-estate market. 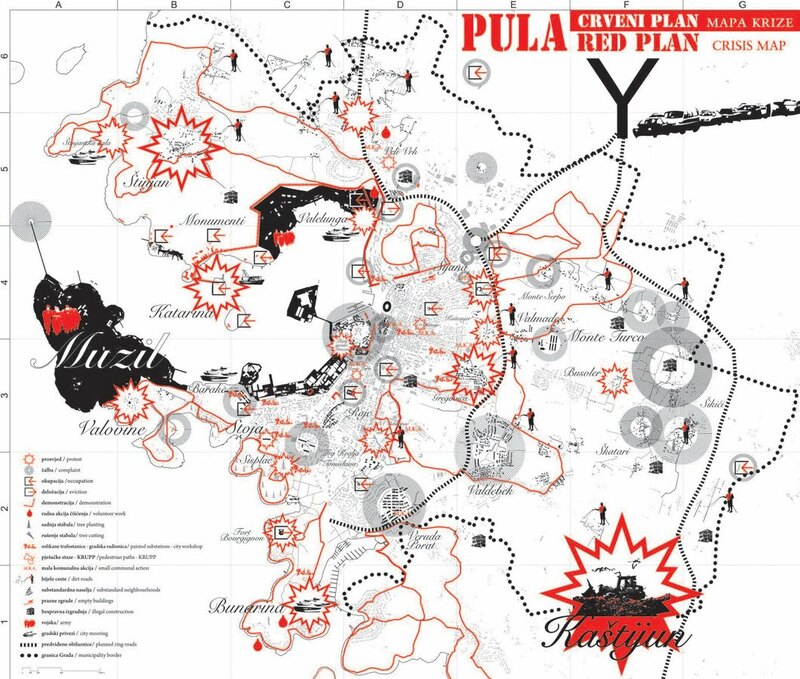 The master plan of Pula illustrates the contradictions brought about by such economic development. In the narrative part of the plan, the statistical data show that the small industry sector is the most dynamic segment of the city's economy. However, the graphical part of the plan does not offer any locations for small industry. To the contrary, it allows for an increase in the number of beds in the tourist zones and the number of moorings in nautical marinas. Tourism and real estate became the main pillars of economy not through its independent development, but through political decrees. The citizens who don't have the means or are not interested in speculation must choose low-wage jobs in construction or temporary work during the tourist season. However, even the local speculators are excluded from the plans for the ex-military areas in Pula. The government decided to give a 66-year lease for 180 hectares (445 acres) of such land to only one private corporation. If this idea becomes reality, only one company will manage an area that is the size of a quarter of the town! 3) Citizens are excluded from the coastal zones. The prices of real estate on the seaside correspond to the prices on the global market, since the coastal areas are treated as "attractive locations." For the people who live on the coast, however, the place they live in is not "attractive," but simply their living environment. Real-estate prices that aim at global buyers exclude the impoverished local population and force it to relocate inland. Another method of exclusion is physical--erecting wire fences. The newly built "resorts" around towns enclose large tracts of land by the sea and charge for access to what used to be common land. The Muzil peninsula in Pula offers a dramatic example of this trend: after the military left Muzil, the state, cooperating with regional and local authorities, put two dozens of armed soldiers in charge of protecting the area from the citizens of Pula, until the peninsula is taken over by the corporation that plans to build golf terrains there. Because of these three forms of exclusion, the Initiative for Muzil was formed with the goal of ending the repression described above. However, it is too late for integration of this Initiative in the institutional structures of the state. The state hegemony has already proved capable of absorbing similar movements without radically reconsidering and reforming the modalities of its functioning. The Muzil Initiative demands that the conditions of exclusion be transformed into conditions for autonomy, i.e. that three forms of exclusion become three forms of autonomy--political, economic and spatial. The Initiative starts with the assumption that autonomy is a necessary condition for production, but it is a condition that won't be given to us--it must be created. 1) The Initiative is an informal group of individuals that are engaged directly, independently from various associations and institutions they might belong to. The purpose of this form of collective action is political autonomy, i.e. political action removed from political parties, government and the state funded model of non-governmental organizations.A description of the Initiative as a form of pressure on the decision-making process of the executive branches of government is thus insufficient. The Initiative creates its own politics, develops it parallel with the ruling one, and makes decisions without contacting executive powers. The opening of the Muzil peninsula was not a decision proposed or accepted by the executive power; it was a decision made by an initiative with no instrumental power. But, it will be impossible to avoid putting this decision into practice. By creating political autonomy, politics is removed from the parliament, currently an instance with an absolute monopoly on politics. Through the form of autonomy, politics appears in the town, in the street, among the people. Thus, a direct democracy is founded, that will allow the citizens to make decisions without the mediation of delegates. A micro-politics is hence created, a politics of concrete local problems. 2) In its work, the Initiative produces value independently from the market. In the current economic relations, this value cannot be recognized. The Initiative practices an autonomous economy. The production of knowledge, communication, social relations, but also newspapers, video and audio material, music events, public discussions and urban studies does not possess value that could be described in the terms offered by the hegemonic economy. All these products are free and available to all. A network of different individuals, with different kinds of knowledge and means of production, creates value based solely on the investment of one's free time. The basis for the creation of an autonomous economy is trust, solidarity, and the desire for the establishment of a common goal--autonomous politics. 3) In order to practice this sort of economy, however, space is required--that is the third level of autonomy. An autonomous space is one that eludes the dominant logic of property as well as the dominant logic of defining the purpose of space. If the real estate market presents the dominant form of economy, and if property is the fundamental ideal of the capitalist state, then the right to autonomous space represents the most radical kind of resistance to such economy and such state. Pula already has several autonomous spaces. This fact made the creation of this initiative and an autonomous politics possible. After the demilitarization of the city, a number of spaces remained empty, waiting to be included in the real estate market. But this never happened. One of the first autonomous spaces was the Casoni Vecchi fort in the Vidikovac neighborhood, where the Monte Paradiso festival started taking place in the early 1990s. From a music venue for punk concerts, this space turned into a meeting point for all generations of people from Vidikovac. The fort is located near the neighborhood municipal offices and functions as its informal extension. Much bigger than the Casoni Vecchi fort is the social center Karlo Rojc. This ex-military barrack was squatted in 1997, after its temporary residents, the refugees of the last war in Croatia, left the building. After unsuccessful attempts at expulsion of the squatters, the City finally legalized their stay there and decided to let the space free of charge to local non-profit organizations. It took 10 years for the tenants to occupy the building. Today, Rojc is a home to over 100 different organizations dealing with culture, music, and social issues. Although this heterogeneity resulted in very weak links between the organizations, they all have one thing in common: Rojc became the central space for the organization of free time in the city and is often referred to as a "third home." Another, even larger attempt to create autonomous space took place in the Katarina-Monumenti area on the northern part of the Pula bay. This is a big ex-military complex with several abandoned barracks, magazines, and different army buildings. After the military left, people started using the space for music and arts festivals. First such event took place in 2005, after which the number of festivals constantly grew, in order for the festival schedule of Katarina-Monumenti to be now fully booked during the whole summer. Along with this development, the area started to be used for marginalized economic activities that could not find adequate locations elsewhere. The Katarina island was thus occupied by the fishermen who spent years and years waiting for the local authorities to act on their promise and build them a fishing harbor. After years of patient waiting, they decided to create their own harbor in the abandoned military complex. Car mechanics and shepherds also use the area. The local population started using it for sports and recreational activities, and some of the buildings are permanently inhabited. The examples of Katarina and Monumenti differ from the previously created autonomous spaces, because the autonomous economy in these locations outgrew the production of social relations and culture and, for the first time, moved into the material sphere. The working name given to this model of autonomous space is komunal, a term which in the local Istrian dialect describes common property, i.e. property that is neither state- or city-owned, nor private. If we compare the experience and the results of the transformation of ex-military areas into autonomous spaces to the "official" transformation of abandoned military buildings, we come to surprising insights. Informal initiatives created 900m2 of autonomous space in Casoni Vecchi, 25.000m2 in Karlo Rojc, and 30ha in Katarina-Monumenti. On the other hand, the city authorities managed to turn the 30.000m2 of the Vladimir Gortan barracks into the bus station and office spaces. The ratio between the autonomous and official action is thereby 10:1, and speaks clearly in favor of autonomy. This kind of statistics is a great motivation for the future actions of the Initiative, but also a great responsibility. The actors of autonomy in Pula are aware of the fact that their actions surpass the limits of traditional squatting. Comprehensive, long-term activities of the marginal squatter culture can develop into a movement capable of transforming the urban environment. The political, economic and urban models employed in this transformation expand outside the autonomous spaces and ultimately transform society. The next important action of the Initiative is the opening to the public all of the 180 hectares of Muzil, currently still under military control. The aim of the Initiative is to open the last military zone in town to common use, and create the conditions for its autonomous development. Spaces like Muzil are an ideal laboratory for the creation of new social and economic relations. Only through this kind of practice, and a direct application of theoretical principles, we can create models that could replace the current capitalist one. These are experiments in post-capitalism! Latest images of Pula, a city where the 1st conference on Post-capitalist City will take place from 14. to 16. of August.